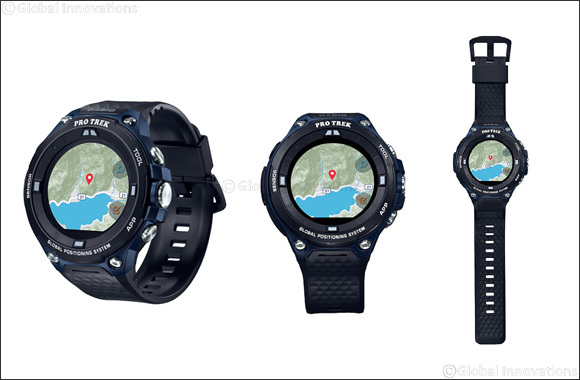 Dubai, UAE, August 16, 2018: CASIO has announced the UAE launch of the Pro Trek WSD-F20A - a new smart watch built specifically for the outdoors. The new model is being offered exclusively by Sharaf DG for a limited time period only and can be pre-ordered starting August 16, 2018 with an expected delivery date of August 30, 2018. According to the company's senior executives, the Pro Trek WSD-F20A, is CASIO's second Wear OS (Android) smartwatch model, which has been carefully designed and developed to meet the demands of more serious outdoor applications. The new unit also offers a built-in GPS (which you can access even when in offline mode) and a compass--tested to meet military specifications with water resistance of up to 50 metres. The Pro Trek WSD-F20A is lightweight and is made of highly durable resin parts and designed with a simple button layout that is easy to operate. The smartwatch can also connect to any Android compatible device, which allows users to utilize applications like an exercise timer, Equilab, Ski Tracks and even fun games like Zombie Run and Fishbrain. The new Pro Trek WSD-F20A can be pre-ordered online via the Sharaf DG webpage (https://uae.sharafdg.com/casio-pro-trek-smart/) and will also be made available at Sharaf DG outlets located at Abu Dhabi Mall, Abu Dhabi Duty Free, Al Ain Mall, Ibn Battuta Mall, Deira City Centre, Dubai Mall, Mall of the Emirates, Sharjah Megamall, Mirdiff City Centre and Times Square Mall. The smartwatch is priced at AED 1,499.